As you know, I’ve been arguing all along that the Vikings could wreck Christian Ponder by starting him before he’s ready, especially if he’s under assault because of an offensive that cannot protect him. Vikings coaches wouldn’t be saying such things if they weren’t concerned about setting expectations, probably both for their rookie quarterback as well as their fans. But even when the Vikings were dominating the Cardinals early, the boos rained down on Donovan McNabb with every errant pass attempt. And there were many. There’s no hiding the fact that we’d probably have been better off retaining the services of Brett Favre one more year than signing McNabb. In his defense, there were several dropped balls by his receivers Sunday, he did run for a score, made an athletic escape and throw to Devin Aromashodu, and got his first win as a Viking. And when you lead at the half for every one of your games yet still start 0-4, plenty of blame can be pointed at the defense as well. But McNabb has been awful. We knew about his predilection for hitting his receivers in the feet but he’s been inaccurate on crossing routes, on out routes, on screen passes and on deep balls. The 60 yard catch and run to Aromashodu on Sunday was one of the ugliest wobblers I’ve seen in a long time. Practically end-over-end. Look, receivers get paid to catch the ball, so if it’s in their vicinity, they need to catch it. If they get a finger on it, it’s on them to catch it. But it is a fact that a tight spiral is far easier to catch than a wobbler. I speak from the experience three broken fingers, all of which came on poorly thrown, wobbling passes. I’m not asking for Warren Moon‘s spiral perfection but Joe Kapp?? Actually, that’s an insult to Joe Kapp. Sorry, Joe. The most damning thing with McNabb, though, is his inability to convert on third down. I think the stat they showed during the game was something like 37%. That’s abysmal. Yeah, you need the help of your supporting cast but it’s true too that great players can carry a team, as Adrian Peterson did this week. We’re clearly not asking McNabb to win games for us so are we asking him not to lose them? And is that the problem with Ponder? That he might lose games for us. Probably. The only good thing McNabb has done is not turn the ball over. And that’s the one thing you can expect from a rookie quarterback: Turnovers. But benching your starting quarterback after the team just notched their first victory of the season, as talk radio and the fans want, is conceding the season and that’s something a rookie coach cannot do for the sake of the respect he commands from his players and for the sake of attitude of his tenure. But at some point, that risk dissipates and it become obvious you need to get Ponder his starts. In addition to the fact that you can’t bench McNabb after the team just won, after watching the Bears defense last night, the Vikings could very well go into Soldier Field and come away with their second victory. Looking at the Vikings schedule, you obviously can’t give Ponder his first start against the Packers, even if it is at home. The following week at Carolina might be an option. The Panthers have given up plenty of points this season and Ponder would have the added motivation of going against the number one pick and a draft class member in fellow rookie quarterback Cam Newton. Hanging with Newton would put a smile on his face and give Ponder confidence. But then he’s got to face tough Oakland and Atlanta teams until he gets to the only soft team left on the Vikings schedule in the Denver Broncos, and who knows if they’ll have turned it around by then behind Tebow. This is all predicated upon the notion that Ponder is not yet ready to start. When he is, then Leslie Frazier should start him as soon as he finds an opening where doing so will not harm his team’s internal dynamics. But then there’s always Joe Webb to consider. 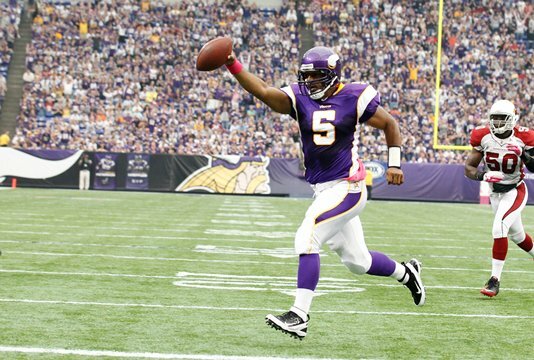 If McNabb ain’t doin’ it for us and Ponder’s not ready, why not start Webb?